The Burke Library is one of the largest theological libraries in North America, with over 700,000 items and extensive special collections. This includes the Bonhoeffer Collection, the Gillett Collection of American History and Theology, the Missionary Research Collection, the Sacred Music Collection, and many others. 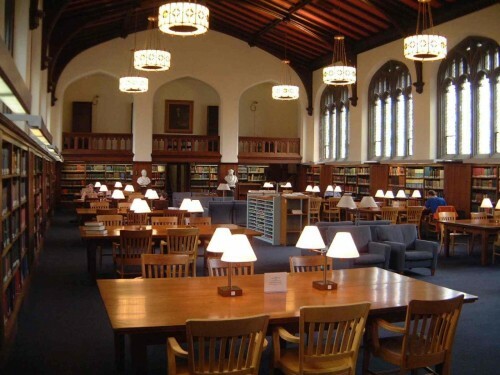 The mission of the Burke Library is to identify, acquire, organize, provide access to, interpret, and preserve for the future information in the field of theology and contextually related areas of study, while supporting the specific instructional needs of Union and Columbia University. Throughout its long history, Burke Library has maintained its commitment to the needs of both teaching and research, serving the Union community as well as a wide spectrum of national and international scholars and researchers. The library reflects in its collections the pluralistic and ecumenical concerns of the Seminary, while maintaining its role as a comprehensive resource within the limits of its collecting policies. In short, for all major theological, ethical, and historical pursuits, Union has one of the best libraries in the nation. To learn more about Burke Library, you can visit their website here.